Punjab cannot afford to falter an inch in their last two matches to be in contention. 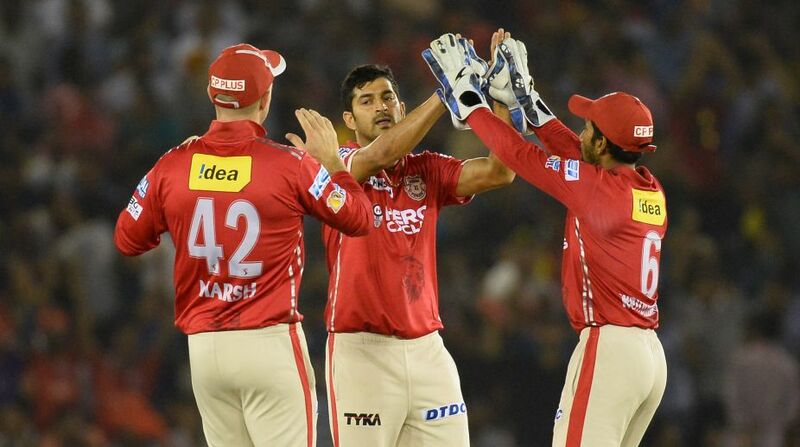 Kings XI Punjab will need to win both their remaining two games to be in fray for an IPL playoffs berth and pacer Mohit Sharma says it is always good to have pressure as it brings out the best in a team. Needing a win today to keep their play-off hopes alive, Punjab produced a clinical bowling effort to beat Kolkata Knight Riders by 14 runs here last night. “I think it is important to have pressure on you. If there is no pressure, then there is a problem somewhere. Pressure is important when you are playing because it can bring out the best,” Mohit said at the post-match press conference on Tuesday. Lying at the fifth spot in the league table with 12 points from as many games, Punjab cannot afford to falter an inch in their last two matches to be in contention. KXIP will take on table toppers Mumbai Indians in Mumbai on Thuesday before facing Rising Pune Supergiant in Pune on Sunday. “T20 is such a game where big names don't matter. A team is as good how it performs on a given day, which is what counts. The team which plays it's best game on a given day wins,” Mohit said. “In T20, you must have seen that a team which is number one loses against a team which is placed at number eight position. We will focus on our processes and try to execute our plans well in the upcoming games,” he said. In Tuesday's game, Kings XI scored just 167 for 6 after being put into bat, but riding on a fine bowling display the home side restricted KKR to 153 for 6 to win the contest. Mohit praised Rahul Tewatia's four-over spell in which the young leg-spinner, playing his maiden game of the season, picked up two crucial wickets of Gautam Gambhir (8) and Robin Uthappa (0), giving away just 18 runs. Mohit termed Tewatia's spell as the turning point of the game. “Rahul Tewatia played a crucial role. The spinner was playing his maiden game of this season and only his second IPL match. He took two key wickets of Gautam Gambhir and Robin Uthappa. I thought that was the turning point,” Mohit said. Mohit himself bowled well and accounted for the wickets of opener Sunil Narine and dangerous Yusuf Pathan. But he stressed that it Tewatia's spell which made the difference. “According to me, the four overs bowled by Tewatia were the turning point in the match,” Mohit reiterated. Mohit also insisted that Chris Lynn's (84) run out in the 18th over tilted the match in Kings XIU's favour. “Having Lynn out in any over is always going to be crucial because he is such a great player. He never spares a loose delivery. “You saw when he got out yesterday the match turned in our favour. The incoming batsmen who came in at the fall of Lynn's wicket had no time to adjust and could not go for the big hits right away,” Mohit said.